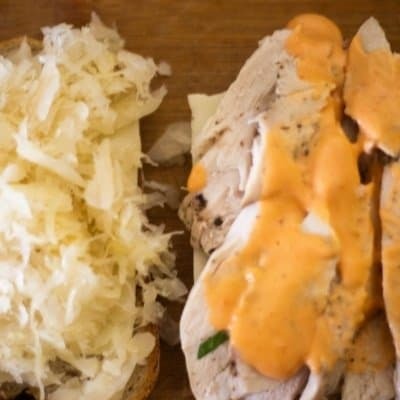 Do you have leftover turkey, enjoy a turkey Reuben, also known as A Rachel! A delicious sandwich that assembles in minutes and tastes amazing! Thanksgiving leftovers at its finest, delicious! Now that we have enjoyed our Thanksgiving Celebration, we have leftovers! Boy, do we have leftovers! What do we do with all that turkey, cranberry, and dressing? 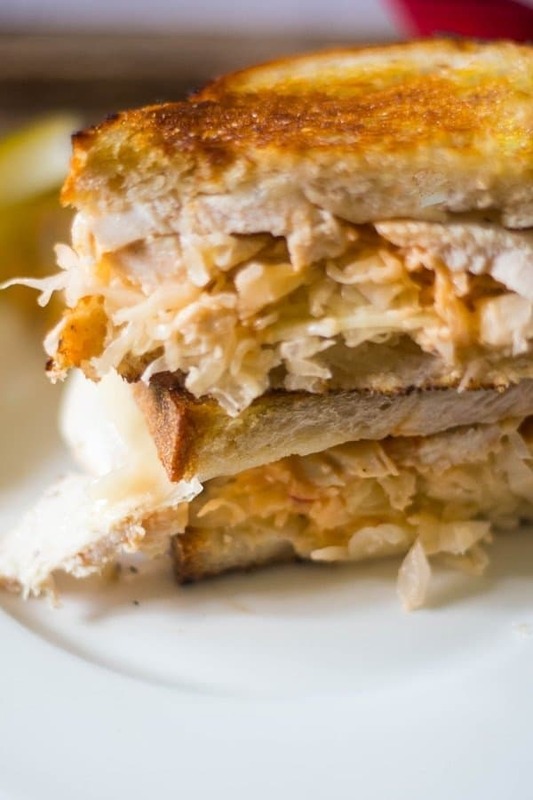 To begin, make yourself a delicious grilled Rachel sandwich filled with turkey, sauerkraut, swiss cheese, and Russian dressing! When I started experimenting with my Thanksgiving ingredients I got to thinking what can I do that is a little different this time! That got me thinking about Saint Patrick’s Day, don’t ask, I have no idea why! Well, part of my favorite part of Saint Patrick’s Day is leftover corned beef. See, there is a method to my madness! Clearly, there is no corned beef today. There is turkey, lots of turkey! I told the family we were giving Turkey Reuben’s a try and it went well, really well! Darn delish! Can I use Turkey from the deli counter if I don’t have leftover turkey? Absolutely! The first time I had a Rachel Sandwich was at a NYC diner. They used a deli cut turkey and it was delish! Where did the Reuben originate? A few versions! One is a gentleman from Nebraska called Reuben Kulakofsky made it for his buddies during a poker game. Another version is that it was made in New York City by William Hemmerly for a restaurant owner Arnold Reuben. I love a Reuben Sandwich so I am just happy it was invented! Why is a Turkey Reuben called a Rachel? What is the difference between a Reuben and a Rachel Sandwich? A Reuben is made with corned beef and a Rachel is made with Turkey and some put coleslaw on the sandwich. What sauce do you put on a Rachel? 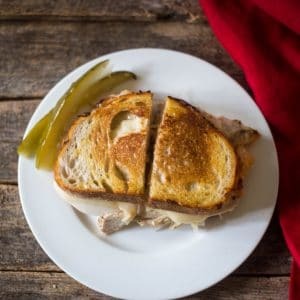 Can I use turkey that is not from leftovers to make the Reuben Sandwich? Absolutely! 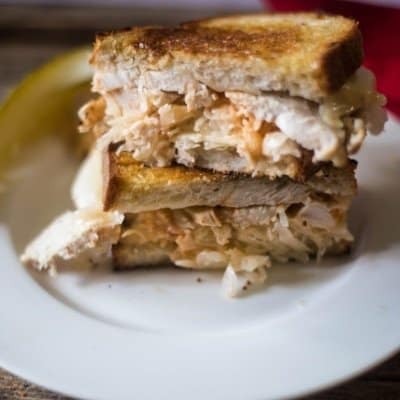 I love using Thanksgiving leftover turkey but any type of turkey can be used to make the sandwich, smoked turkey works well. Feel free to swap and use corned beef as well! Cast Iron Skillet: I love the sear the bread gets when using a cast iron skillet. I highly recommend using one for Reuben Sandwiches! Place swiss cheese on unbuttered side of bread. Add sliced turkey to one side of the sandwich. Put some sauerkraut on the other slice. Top the turkey side with Russian Dressing. Put either butter spray or a little butter in a hot pan. Place the sandwich in the pan. Grill till golden brown. Flip, do the same, grill till golden-brown. I love any comments or questions! I would love for you to share your comments or questions below! 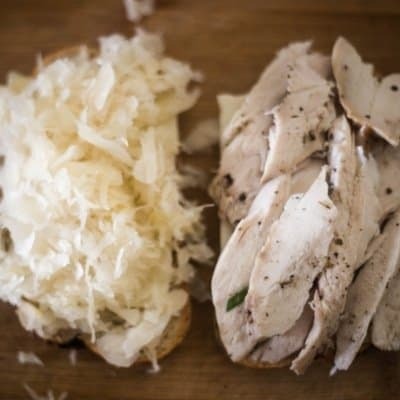 Enjoy a favorite sandwich at home with a healthy kick by using turkey! 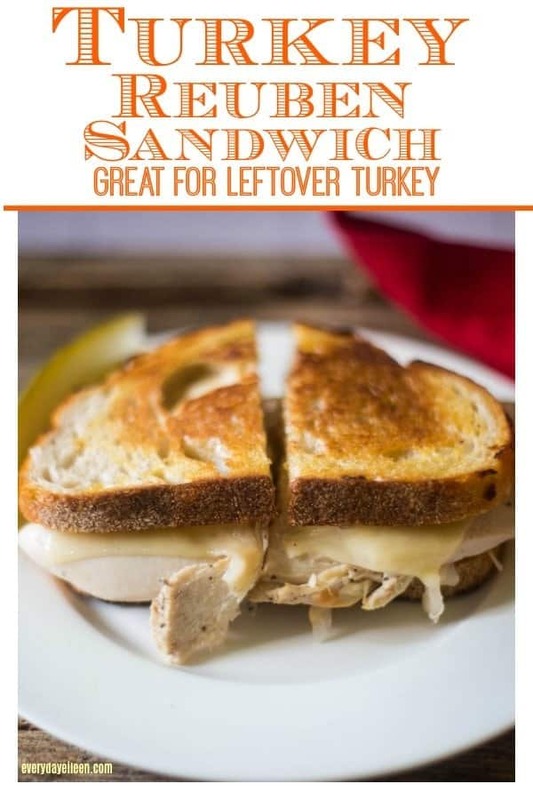 Better yet, use leftover turkey to make an amazing sandwich in about 5 minutes! Enjoy this recipe, please give it a 5-star rating! Also, any comments are super helpful for me and very much appreciated! 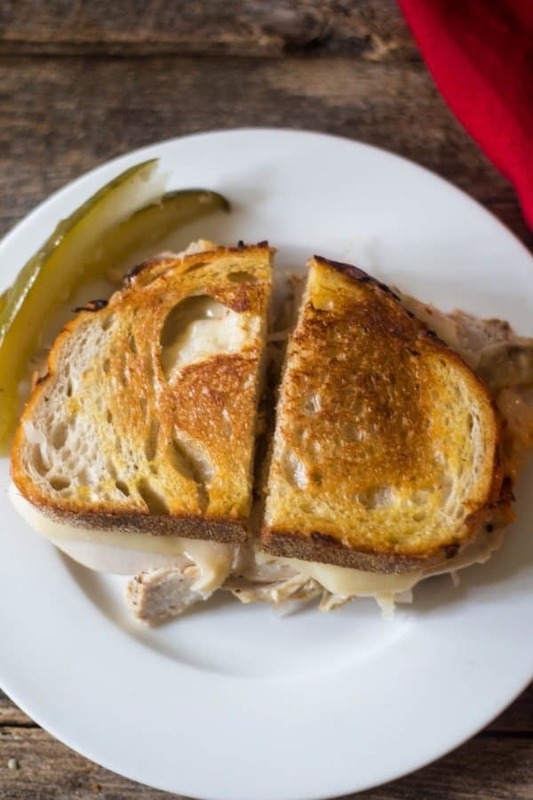 An easy sandwich that uses leftover turkey to make the most delicious Turkey Reuben Sandwich! Feel free to also use deli sliced turkey or corned beef to make delicious Reuben Sandwiches, better than a dinner! Lightly butter one side of each slice of the bread. 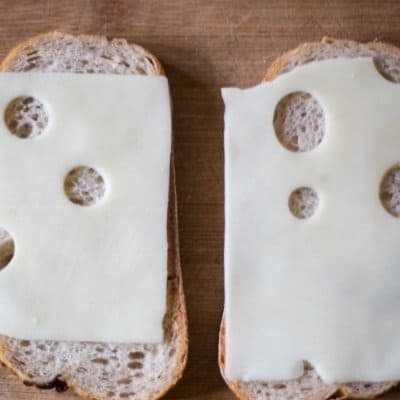 On the other side of the bread, lay a slice of Swiss Cheese on each slice of bread. 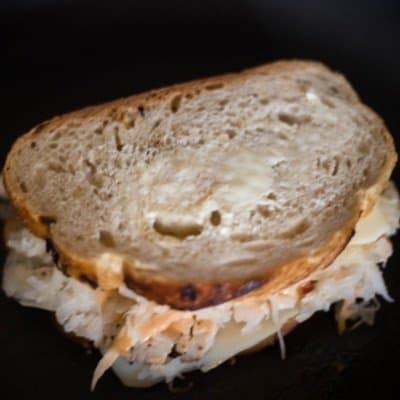 On one side of bread, place the drained sauerkraut. On the other slice, place the turkey. Spread the Russian dressing over the turkey. Close the sandwich. Note 1: If you have an amazing bakery, buy a loaf of their rye bread if possible, or make a home-made loaf of rye bread. Note 2: This recipe calls for leftover turkey meat. Deli sliced turkey can be used. Corned beef and leftover corned beef can also be used. Note 3: Drain the liquid from the sauerkraut. You can also use a cotton towel to place the sauerkraut in and drain the kraut thru the cotton cloth. Note 4: I prefer low-fat Russian Dressing. You can use regular Russian Dressing. Some use Thousand Island dressing. 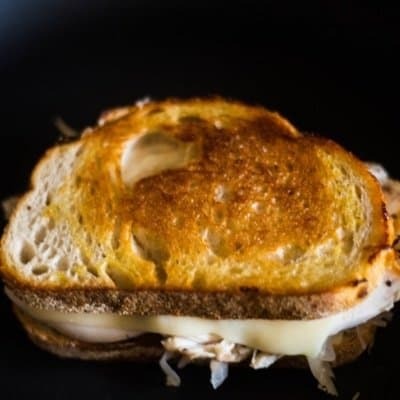 Note 4: If the sandwich is browning quickly and the cheese is not melting, place a pot cover over the sandwich for a few seconds to melt the cheese quicker.